Samsung is one of the best - if not the best - solid state/flash storage manufacturers on the planet. They make SSDs for desktops and laptops, flash storage for phones and tablets, and much more. Today, the company announced that it started production of 512GB eUFS flash storage chips, designed for use in phones, tablets, and other mobile devices. The Universal Flash Storage (eUFS) solution uses 64-layer V-NAND chips, a notable improvement over the company's previous 48-layer 256GB eUFS. Samsung has been using V-NAND across many of its products over the past few years; instead of reducing the cell size of flash storage, the cells are stacked on top of one another. 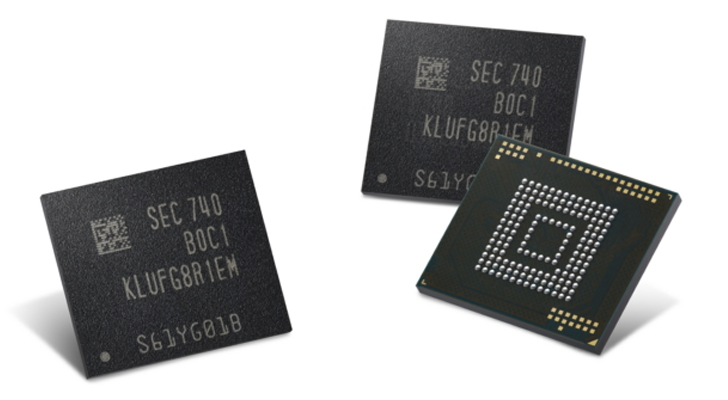 For the 512GB chip, Samsung boasts sequential read and write speeds of up to 860 MB/s and 255 MB/s, respectively. Random read and write speeds are rated at 42,000 IOPS and 40,000 IOPS. Smartphones with 256 GB of internal storage are still a rarity, so it will probably be a while before we see 512 GB phones. Still, the technology exists now, and that's pretty exciting.